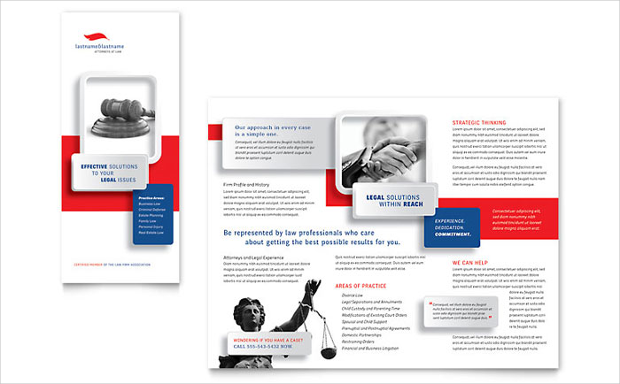 A law firm brochure is a document created for a specific audience –its clients — highlighting the firm’s activities, areas of specialization and work and profiles of lawyers, partners, and all associated staff. It has to be drafted and designed carefully so that it incorporates all necessary information and creates an impression of professionalism, integrity, and efficiency. In other words, the design should be such that the very first look impresses a prospective client. 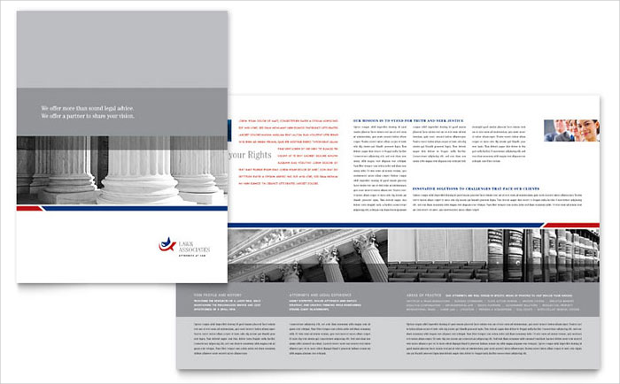 Such a document could either be a bi-fold brochure, a tri-fold one or even a square brochure, depending on the firm’s objectives, vision &amp; mission statements, policies as also the volume of content in terms of copy, illustration, and graphics involved. 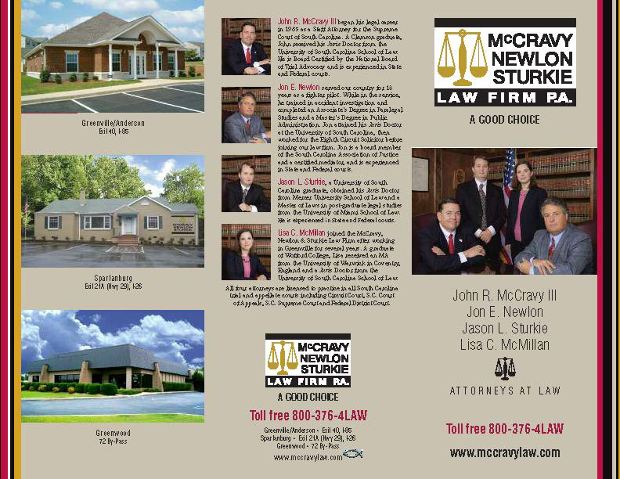 Such a brochure is somewhat similar to a real estate brochure, which too, caters to a specific clientele and is also similar in design. 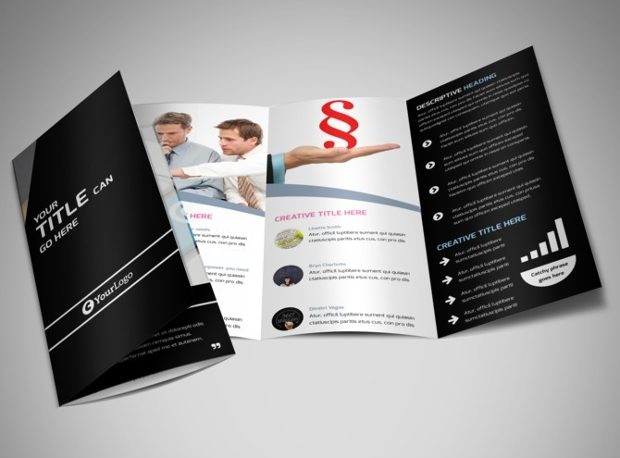 You may also like Brochure Templates. 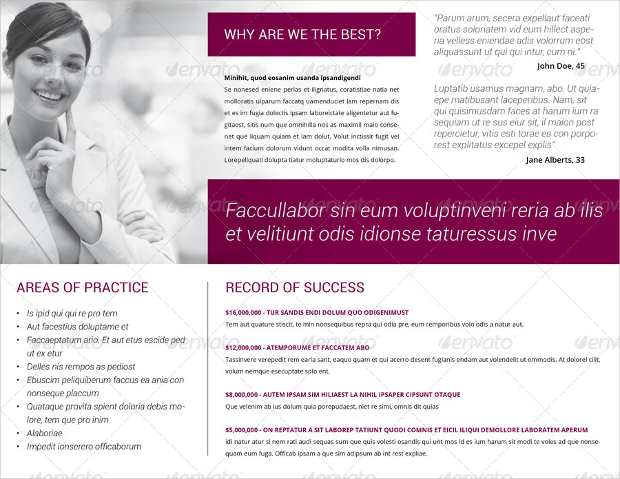 This template is uncluttered and has a clean design, is crisp in terms of content, has a high visual impact, is highly editable and of the best printable quality. 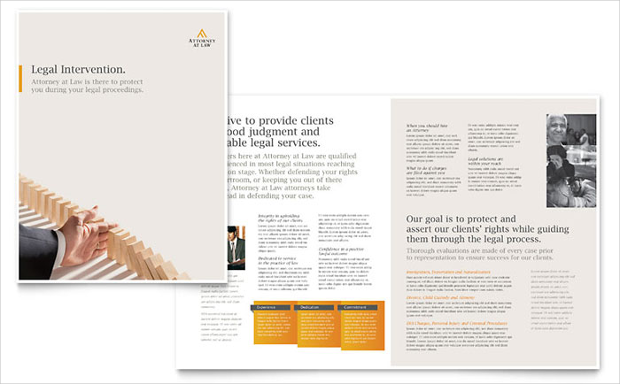 Ideal for any business, law firm and corporate. Designed on Photoshop, this template is fully editable and customizable to your specific needs within seconds! Its features are: 2x front &amp; back PSD tri-folding templates; fully print ready; CMYK color; Original PSD RGB Files included; 300 DPI images; layered files; attractive, eye-catching fonts and great customer support. The template page size is 11” x 17” and is a half fold. The file formats are Adobe InDesign, Microsoft Word, Illustrator, Apple Pages, Publisher, CorelDraw, and QuarkXPress. 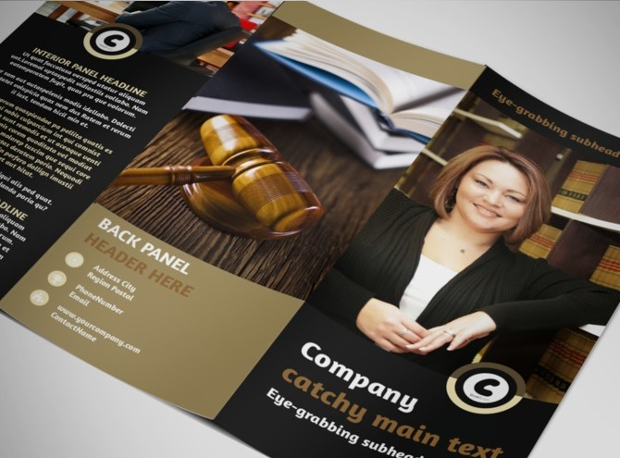 Fully customizable with 4-color layouts as also graphics files. Its other features are 300DPI high-resolution photos, original logo and artwork designs that are instantly downloadable with online access available 24/7. 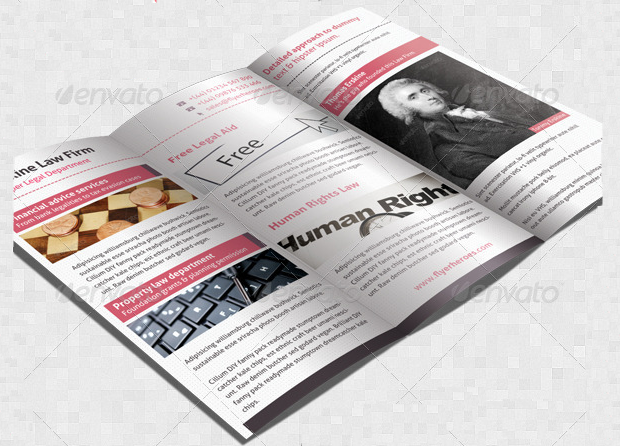 The template is compatible with: Adobe InDesign CS4-6 & CC; Adobe Illustrator CS4—6 &. 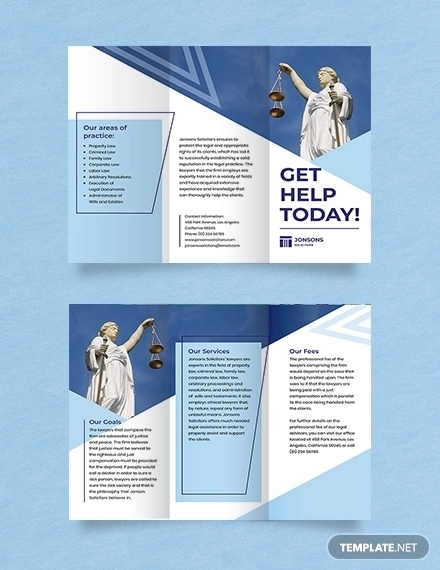 This tri-fold template has a page size of 8.5” x 11”. The file formats are: Adobe InDesign, Microsoft Word, Illustrator, Apple Pages, Publisher, QuarkXPress and CorelDraw and has sections for About Us, Areas of Practice, Record of success, Address, Names of Partners etc. 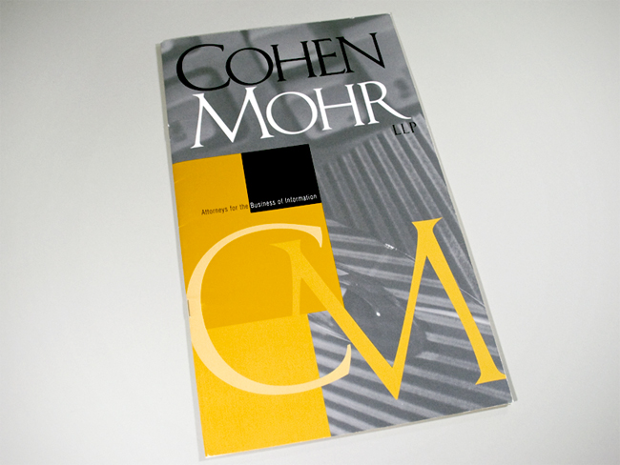 Fully customizable, four- color pages with graphics files. 300 DPI high-resolution photos with original logo designs and artwork. Instantly downloadable with 24X7 access online. Compatible with: Adobe InDesign CS4-6 &amp; CC; QuarkXPress 2015, 10 &amp; 9: Adobe Illustrator CS 4-6 &amp; CC; Microsoft Publisher ’16, ’13, ’10, ’07; CorelDraw X 3 — 7, Microsoft Word ’16, ’13, ’10 &amp; ’07; Apple iWork Pages 4 &amp; 5. Can be commercially printed or produced digitally. Fonts include: Adobe Garamond Expert Semibold; Adobe Garamond; ITC Benguiat Book; Bureau Agency Bold; News Gothic Condensed &amp; Bold Condensed. 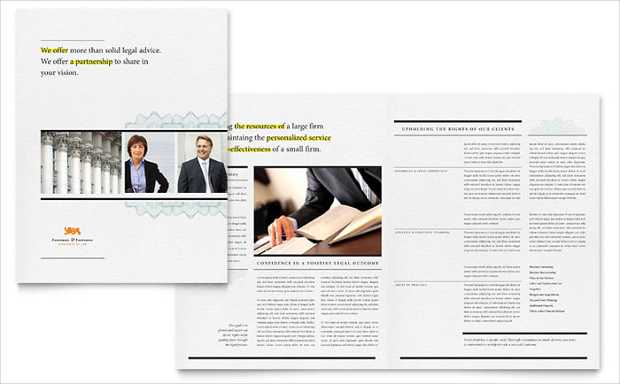 Idealdeal for any small, medium or large law firm, this bi-fold, 4-page template is fully customizable to your specific needs. 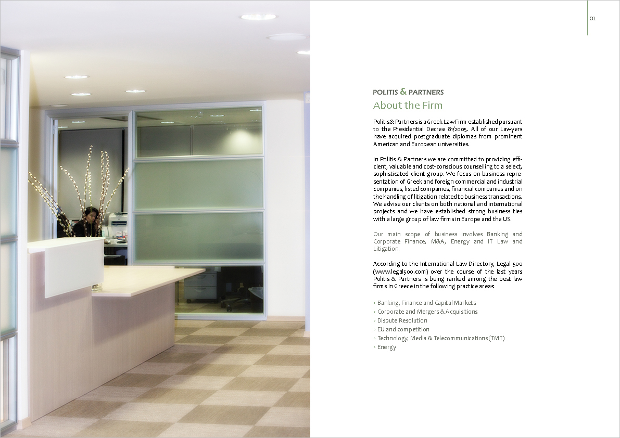 InDesign format; standard A4 size along bleed area provision; CMYK Color with a resolution of 300 DPI; ready to print. Fonts include: Lato, Sansation, Oswald and Bebas-neue. This half fold 11” X 17” template is fully editable and customizable and its file types are Apple iWork Pages, Adobe InDesign, Microsoft Word PC and Microsoft Word Mac. Readily printable both commercially and digitally. Template Size: 11″ x 8.5″ ( A4 size). Easily changeable and customizable. Comes with its unique builder for color themes. Personal images may be uploaded or inserted or even bought. Printable both digitally and commercially. 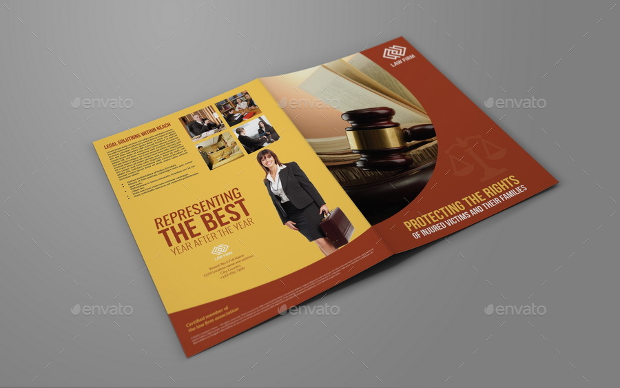 This template is A4 size (297 mm X 210 mm) and may be folded twice to create six segments to publish all relevant text, photos, images and graphics. Convenient in terms of costs and is fully editable and customizable. 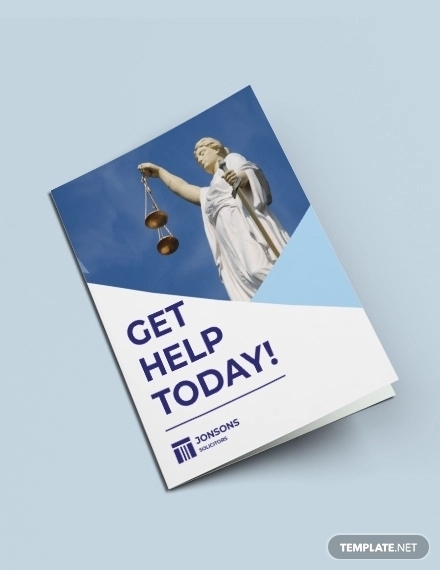 Ideal for law firms providing pro bono services. This template is also fully editable and may be produced both commercially or by way of laser or inkjet printers. Its features include: 300 DPI high-resolution EPS, JPG and PNG raster images and graphics. Accurate CMYK and/or PMS colors May be used with QuarkXPress, Adobe PageMaker, Adobe InDesign, CorelDRAW, Adobe Illustrator, Microsoft Word and Microsoft Publisher. 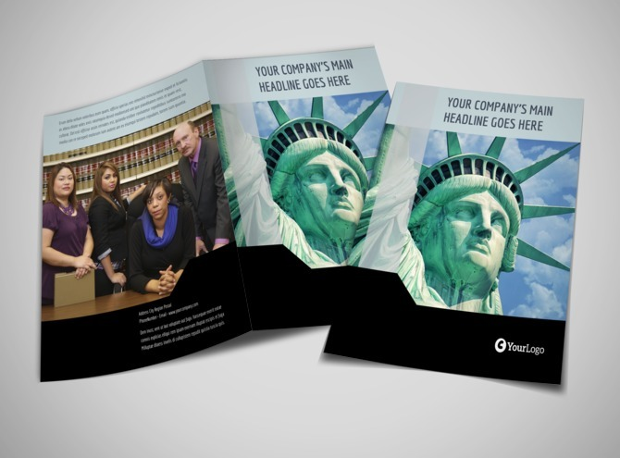 In sum, the tri-fold brochure turns out to be the most convenient in terms of production and mailing costs and its compact size makes it easier for large-scale distribution. 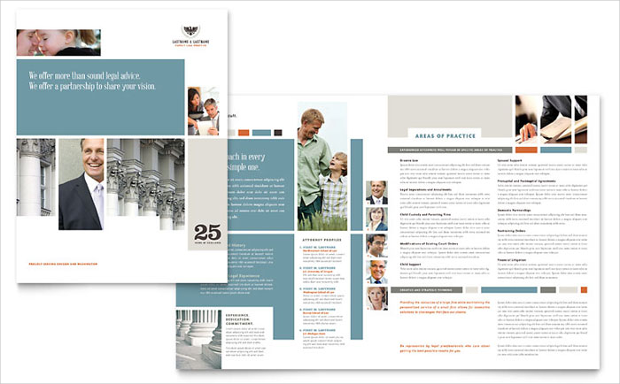 However, the bi-fold brochure also is a good option if the content volume is high and leaves ample room for elaboration on important data.